On this date in 1901, a two-bit outlaw from a vanishing frontier made his reservations for hell. 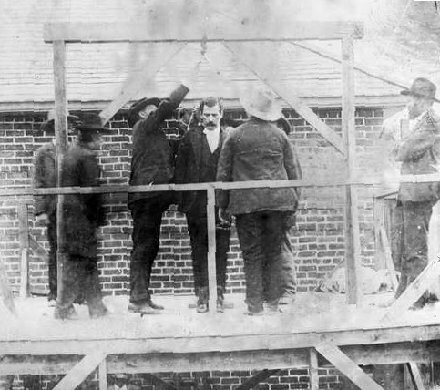 Tom Ketchum — who had become known as “Black Jack” when misidentified with another hombre he resembled — was the last man to hang in America for attempting to rob a train. Given the way the authorities in Clayton, N.M., conducted the job, that’s probably for the best. This Texas-born outlaw enjoyed a colorful career in the 1890s Southwest plundering trains, killing folk, and other distinctively American pastimes. His name attaches to the [in]famous Hole in the Wall Gang. He was finally caught attempting a dangerous one-man train robbery, when a conductor (taking part in his third stickup, and tired of being on the wrong end of the gunbarrel) got the drop on Ketchum and winged him with a shotgun. Too weakened by his injury to escape, Ketchum surrendered himself to the law, and his wounded arm to the surgeons. 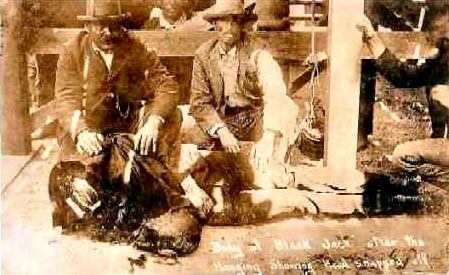 The un-amputated remainder belonged to Clayton, N.M. — New Mexico Territory, that is, which was not yet a state at this time, but was keen on making an example to stanch the tide of train robberies. Then, they actually dropped him. When the body dropped through the trap the half-inch rope severed the head as cleanly as if a knife had cut it. The body pitched forward with blood spurting from the headless trunk. The head remained in the black sack and flew down into the pit. Some men groaned and others turned away, unable to endure the sight. For a few seconds the body was allowed to lie there half-doubled up on its right side, with the blood issuing in an intermittent stream from the severed neck as the heart kept on with its mechanical beating. 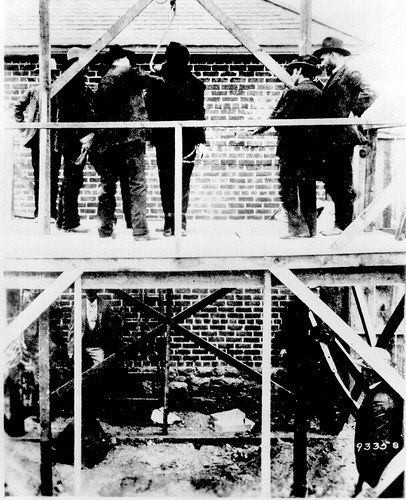 Then with cries of consternation the officers rushed down from the scaffold and lifted the body from the ground. It was only then apparent exactly what happened. 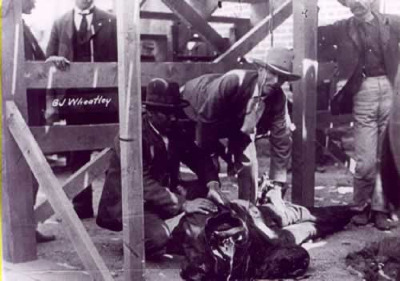 The drop of the body was seven feet and the noose was made so it slipped easily. Ketchum was a heavy man, and the weight of the body, with the easy-running noose, caused the rope to cut the head cleanly off. Dr. Slack pronounced life extinct a little over five minutes from the time the body dropped through the trap. It is stated too much of a drop was given for so heavy a man. Just so we’re clear: a seven-foot drop is much, much too far for a man of Ketchum’s 190-plus pounds. Maybe they were distracted by rumors of an escape attempt. I’ll be in hell before you start breakfast, boys! Let her rip! Fictional? If so, they’re more like what Ketchum’s last words ought to be. Although let St. Peter‘s ledger reflect that Ketchum was a decent enough chap to post a letter to President McKinley on the morning of his own execution copping to several robberies for which other people were imprisoned. Initially buried — naturally — at Clayton’s Boot Hill, this infernal denizen’s grave can now be found (and more than a century on, tourists and admirers do find it) at Clayton Memorial Cemetery. those pictures were in the window of family’s barber shop. I remember as a kid visiting tia flora .uncle ed was moms cousin. clorinda marie dominguez abeyta. Talk about a superfluous wait to state the obvious! Doug, on second look and zoomed in on pic, it is the same hanging. Body is headless. I grew up around around Clayton,NM. I remember when the Eklund Hotel had the news paper and photos plus’s a small version of the hanging. Last I knew all that stuff was in the Folsom mussium Folsom, NM. Old flash pan camras did not work well in shaded aereas black and white photos not always clear. Those pics have faded also. I was told growing up they did not let the public into see the hanging, a wooden fence was built in front of between the hotel and the old jail house. Only a few and news paper people were alounded in. Clayton was full of people from near by towns to watch or true to watch the hanging. My grandfather was in Clayton at the time doing a homestead claim for some land at Capulin,NM./Dead man,NM.at the time. No Doug, it’s not the same hanging. Bottom hanging the man has his head and both arms. Black Jack lost an arm before he was hanged. Another reason he lost his head. Body was off balance when dropped. Noose is always placed to the side of the head to break the neck at the end of the drop. Never showed his head out of hood. There are some oddities about this series of photographs. First, notice the color of the pants on the body after he is hung. They are very light, even were not washed out by the sun. Yet before he is hung, he obviously has quite dark pants on. Further, studying the edge of the bottom of the pants in the top picture, they are clearly over the boot tops, yet in the after pictures, they appear to be tucked into the boots. He also does not appear to be wearing the wide belt to secure his arms shown below but not above. Even the people and scaffold are different before and after. It’s NOT the same hanging! I think in this case the law was just as bad as the outlaw.Iam not saying Iam for outlaw but to do things just as bad is just plane crule what kind of example do we show our children. Caleb Tucker is obviously 12 years old.